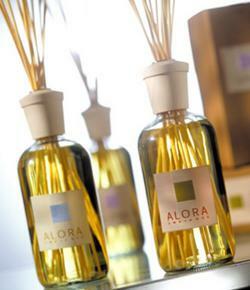 Or “Alora Ambiance” in a nice blend of languages. I saw these a while ago, but only recently went on a air freshener hunt for my friend’s apt that is desperately in need. I wanted the alternative to glade plugins and whatever that new thing is on tv where the family gathers to watch the “puffs” come out to know its working. So as usual, first grab is by the visual. This is a gorgeous way to display the fragrance, glass bottle with wooden sticks gently stuck into it to “diffuse” the scent into the room. Even supposed to last 4-6 months on one bottle. Just a reminder… ambience is a french word, straight up stolen, it was.